As has been discussed previously many times you do not necessarily have First Amendment protections if you say or write something widely considered to be offensive and your employer lets you go. This may get a tad more complicated if your employer is a public (governmental) entity and not a private one. But even with public employers, if you run afoul of laws or employer policies regarding speech that is harassing or hateful you can often find yourself unemployed. 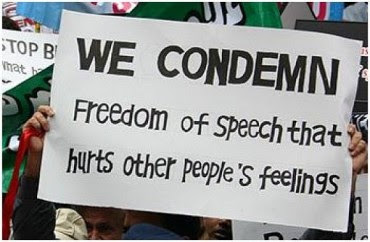 The First Amendment means the government can't stop your disagreeable speech. It's about preventing the government from putting you in prison or fining you for your speech. You are free to say whatever you like. But your employer is also free to decide that your speech is not something with which it wants to be associated. Just as social media has made people more comfortable with sharing a lot of private and personal information, many people seem to forget that social media is NOT you talking to your spouse, relatives, close friends, boyfriend, girlfriend, or even long term business associates. Many of these people probably share some of your world views. And even those who don't usually won't take something you told or wrote to them in confidence and tell everyone without your permission. But when you post something on social media you're sharing it with the world. Taiyesha Baker, a former nurse at Indiana University Health, apparently forgot that when you're not independently wealthy you occasionally have to consider whether the entire world needs to hear your unedited opinion on sensitive issues. 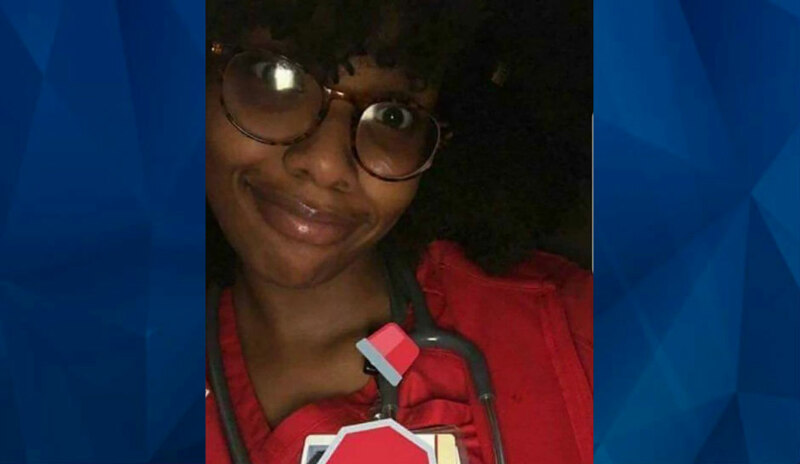 Officials at Indiana University Health said over the weekend they were investigating “several troubling posts on social media” that appeared to be made by a recently hired employee identified in news reports as Taiyesha Baker. 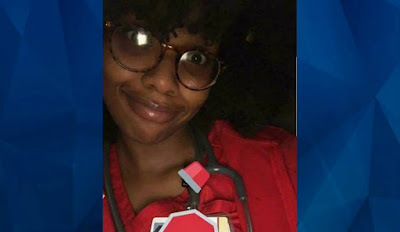 IU Health spokesman Jason Fechner confirmed Monday that the nurse no longer works at Indiana University Health Methodist Hospital in Indianapolis but he would not say whether she was fired, citing company policies. Fechner, with Indiana University Health, said the tweet was the first social media post by the nurse that was brought to their attention. The account has since been deleted and re-created by another user who has been tweeting from it, according to the Indianapolis Star. Baker could not immediately be reached Monday for comment. State records show that she was licensed as a registered nurse Oct. 30 and that her license expires in 2019. Indiana University Health is a private hospital. Indiana is a right-to-work state. Anyone can be fired at any time for virtually any reason. Obviously, if Baker wrote the tweet then she could not continue employment at a hospital where she will on a daily basis no doubt encounter several people with the race and/or gender that she despises. And certainly no hospital, which is supposed to be about care for all regardless of race or gender, would want to be associated with that tweet. 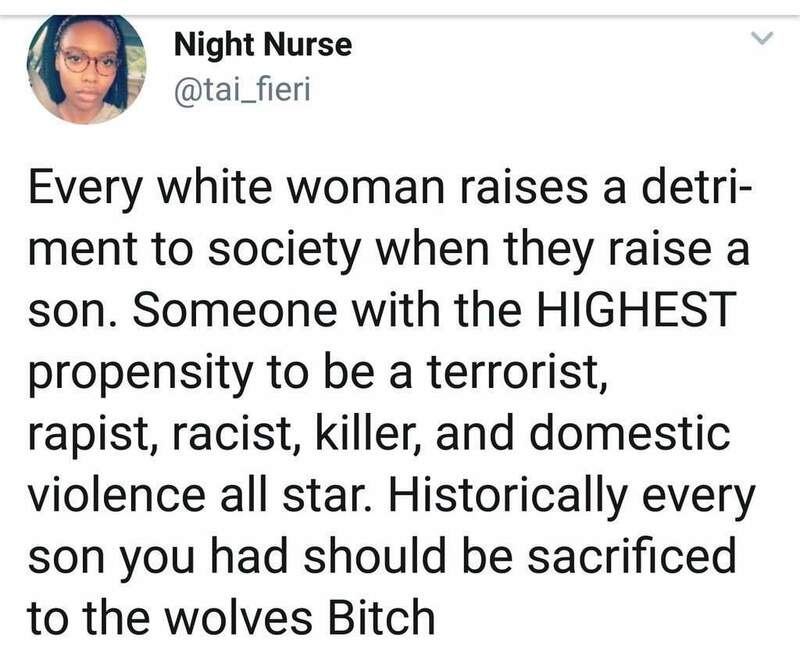 Calling for racial genocide isn't quite what you want your nurses to do. It would be worthwhile to hear from Baker. About the only defense she could offer would be that someone hacked her account and wrote that tweet and/or that despite what it looks like, that wasn't her twitter account. But since she's no longer employed either she really did write the tweet or was unwilling to distance herself from it. And from the hospital's statement it appears that this wasn't the first or only post that Baker wrote which was racially inflammatory. So it goes. I think this incident is an excellent reminder to us all that if you work for someone else for a living, it's wise to keep your social media presence limited, possibly private or anonymous, and definitely non-hateful. That said I think it is really amusing and somewhat hypocritical to see the conservative hatred expressed towards someone who said something offensive. 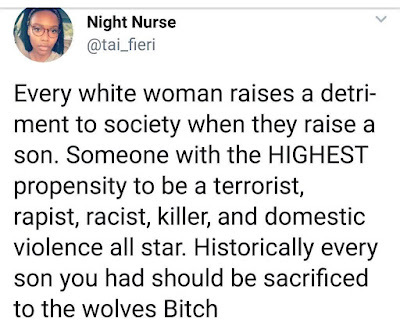 These are often the same people who cheer when police go free after killing someone black or who rush to the defense of white police caught making similarly hateful comments about black folks. As far as I know Baker hasn't shot dead any white twelve year-old children playing on the street or mistaken a white man's wallet for a gun and shot him nineteen times. What Baker said isn't anything you can't find all over conservative websites and blogs, with the races reversed of course. Perhaps everyone should stop negative generalizing. But whatever. I'm okay with this lady losing her job. That's life.